When I am approached to do book reviews of children's book, I have a hard time turning them down! This is especially true when the book teaches kids to be moral and ethical members of society! I believe that you can never instill this too much into the generation of kids that are being raised today. The Principle Game is a great set of books that does just this! Danny the Wizard Lizard and Bli the Fly Guy are colorful characters that are sure to hold kids attention! These books are very fun for little ones to read but at the same time, teach very important lessons like being kind, not judging a book by its cover, not being a bully and telling your teacher! "Dr. Dan and Bli Dugi bring to life in a vibrant way the messages that loving parents and grandparents have for centuries been conveying to their children, the importance of family, friendship, community, and fairness. After a combined fifty years of family practice experience as a Physician and Physician Assistant team, the Dugis have created a way to capture the hearts and minds of young children outside of the exam room. Welcome to the adventures of The Principle Gang." These lessons are big ones in life, and I always try to teach my children to be KIND, first and foremost. I also teach them that if someone is bothering them to go to the teacher instead of using violence or verbal abuse. 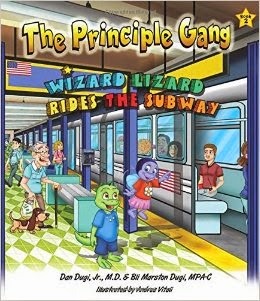 Even as young as kindergarten my oldest son experienced some bullying, so I love that these fabulous books called Don't Judge a Lizard by His Scales and Wizard Lizard Rides the Subway drive home the points I have been teaching my son everyday! The books are colorful, fun and really flow well! They are the perfect bedtime story because they open up a great line of communication about why bullying or judging others by appearances or differences is bad!